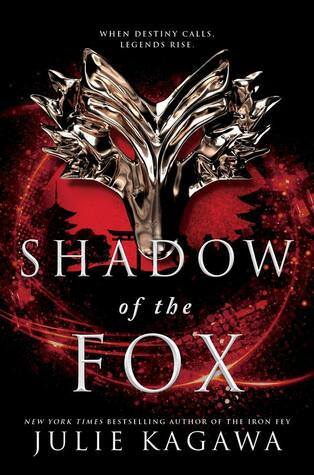 Review I had high expectations for Shadow of the Fox. I enjoyed Kagawa's Iron Fey series and really loved Blood of Eden (Jackal yassss!). I was excited to discover that Kagawa was going to write a Japanese based story. The problem is this story didn't feel like a Kagawa book. It felt like a mashup of anime tropes mashed together. I was explaining the plot of this book to my husband and the first thing he said was that it sounded exactly like Naruto. I told him it read a bit like Inu-Yasha without the annoying mess that is Kagome (and without the amazing Sesshomaru). At certain point it even reminded me of Avatar the Last Airbender. Honestly, that's my main problem with this story. Because it was borrowing from so many anime tropes it's own voice was lost in the shuffle. I wanted to read something original and this wasn't. First, we have the half-kitsune, Yumeko, who has grown up in a hidden temple far away from the world. She is naive and previously wasn't allowed to use her powers. When her temple is attacked by Oni (demons) she sets off on a quest to deliver Scroll of a Thousand Prayers to yet another remote temple. Next there is Tatsumi, a kage from the Shadow Clan who is completely devoid of emotion and only cares about retrieving the scroll for his clan. That is until he travels with Yumeko and maybe his heart starts to melt a little? I got some serious Ash from Iron Fey vibes from Tatsumi which I actually enjoyed because I was a huge fan of Ash throughout the Iron Fey series. Finally, there was a former samurai who was drunk a lot of the time. He lent some comic relief to the story but didn't really do much else. I don't care for this stereotype so I didn't really like his character. Also, I felt that one of his main plot functions was to keep Tatsumi and Yumeko's relationship from progressing too quickly. I did enjoy the main villain who is the Emperor's concubine. I found her to be completely evil and I like a good villain to root against sometimes. That being said, because she was just evil for the sake of being evil, I struggled with her characters motivations. I hope to see those fleshed out further in future books. Despite my qualms with Shadow of the Fox it honestly was a fun ride. It kept my attention from start to finish and while I had personal issues with how the characters felt more like caricatures the plot itself moved at a good pace and I enjoyed the story. Overall, this was a solid three-star read. I wouldn't expect to be wowed by the first installment in the series but because I'm a Kagawa fan I'm going to read the next book. I hope it does a better job of fleshing out the characters and injecting some originality into the plot.